Its a very common question, and just one of the strange things about integrating with Outlook. In order to view the Out’n About! status board – please navigate to the “Out’n About!” folder. We automatically create this folder upon installation, and its usually located next to your existing Outlook folders like “Inbox”, “Outbox”, and so on. Tip: Right click the Out’n About folder here, and “Show in Favorites”. 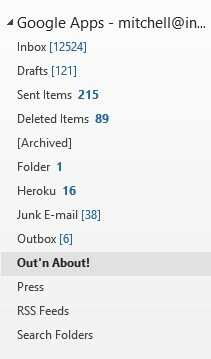 Now the Out’n About folder will be at the top in your Favorite folder list.